Aequorea victoria are brightly luminescent jellyfish, with glowing points around the margin of the umbrella. Light arises from yellow tissue masses that each consist of about 6000-7000 photogenic cells. The cytoplasm of these cells is densely packed with fine granules that contain the components necessary for bioluminescence [1:2] . In other bioluminescent coelenterates these have been characterised as 0.2 micron diameter particles enclosed by a unit membrane, and have been termed lumisomes  . The components required for bioluminescence include a Ca++ activated photoprotein, aequorin, that emits blue-green light, and an accessory green fluorescent protein (GFP), which accepts energy from aequorin and re-emits it as green light  . 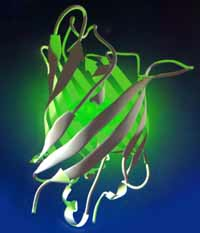 GFP is an extremely stable protein of 238 amino acids  . The fluorescent properties of the protein are unaffected by prolonged treatment with 6M guanidine HCl, 8M urea or 1% SDS, and two day treatment with various proteases such as trypsin, chymotrypsin, papain, subtilisin, thermolysin and pancreatin at concentrations up to 1 mg/ml fail to alter the intensity of GFP fluorescence  . GFP is stable in neutral buffers up to 65oC, and displays a broad range of pH stability from 5.5 to 12. The protein is intensely fluorescent, with a quantum efficiency of approximately 80% and molar extinction coefficient of 2.2 x10(4) cm-1 M-1  (after correction for the known molecular weight). GFP fluoresces maximally when excited at 400 nm with a lesser peak at 475 nm, and fluorescence emission peaks at 509nm . The intrinsic fluorescence of the protein is due to a unique covalently-attached chromophore which is formed post-translationally within the protein upon cyclisation and oxidation of residues 65-67, Ser-Tyr-Gly [6:8,9] . Several genomic and cDNA clones of gfp have been obtained from a population of A. victoria  . The gfp gene contains at least three introns, and the coding sequence derived from one of the cDNA clones, pGFP10.1 has been used for protein expression, first in Escherichia coli, Caenorhabditis elegans [10:9] and Drosophila melanogaster  . Fluorescent protein has now been produced in a number of heterologous cell types and there appears to be little requirement for specific additional factors for post-translational modification of the protein, which may be autocatalytic or require ubiquitous factors. GFP has been successfully expressed at high levels in tobacco plants using the cytoplasmic RNA viruses potato virus X  and tobacco mosaic virus  . In these experiments, the gene was directly expressed as a viral mRNA in infected cells, and very high levels of GFP fluorescence were seen. However, poor or no fluorescence was seen when the gfp cDNA was transformed into isolated cells or transformed plants of Arabidopsis [14-16] . We have shown that expression of the gfp cDNA is curtailed by aberrant mRNA splicing in Arabidopsis. We have engineered mutant forms of gfp, to restore and improve expression of the fluorescent protein. The modified gene now contains (i) altered codon usage to remove a cryptic plant intron, (ii) added peptide sequences to allow targeting of the protein to the lumen of the endoplasmic reticulum, and mutations which (iii) improve folding of the apoprotein during post-translational maturation (V163A, S175G), and (iv) provide equalised UV and blue light excitation (I167T)  . This highly modified variant (mgfp5-ER) is proving useful as a safe and bright marker in transgenic plants  . We expect that the mgfp5-ER gene and its derivatives will also be useful in work with transgenic fungi and animals, where at least some similar problems may be encountered. Image from cover of Nature Biotechnology, F. Yang, L.G. Moss & G.N. Phillips 14:1246-1251, 1996. 1. Jefferson RA, Kavanagh TA, Bevan MW: GUS fusions: ß-glucuronidase as a sensitive and versatile gene fusion marker in higher plants. The EMBO Journal 1987, 6:3901-3907. 2. Davenport D, Nichol JAC: Luminescence in Hydromedusae. Proceedings of the Royal Society, Series B 1955, 144:399-411. 3. Morin JG, Hastings JW: Energy transfer in a bioluminescent system. Journal of Cellular Physiology 1971, 77:313-318. 4. Anderson JM, Cormier MJ: Lumisomes, the cellular site of bioluminescence in coelenterates. The Journal of Biological Chemistry 1973, 248:2937-2943. 5. Morise H, Shimomura O, Johnson FH, Winant J: Intermolecular energy transfer in the bioluminecent system of Aequorea. Biochemistry 1974, 13:2656-2662. 6. Prasher DC, Eckenrode VK, Ward WW, Prendergast FG, Cormier MJ: Primary structure of the Aequorea victoria green fluorescent protein. Gene 1992, 111:229-233. 7. Bokman SH, Ward WW: Renaturation of Aequorea green fluorescent protein. Biochemical and Biophysical Research Communications 1981, 101:1372-1380. 8. Cody CW, Prasher DC, Westler WM, Prendergast FG, Ward WW: Chemical-structure of the hexapeptide chromophore of the Aequorea green fluorescent protein. Biochemistry 1993, 32:1212-1218. 9. Heim R, Prasher DC, Tsien RY: Wavelength mutations and post-translational autoxidation of green fluorescent protein. Proceedings Of the National Academy Of Sciences Of the United States Of America 1994, 91:12501-12504. 10. Chalfie M, Tu Y, Euskirchen G, Ward WW, Prasher DC: Green fluorescent protein as a marker for gene expression. Science 1994, 263:802-805. 11. Wang SX, Hazelrigg T: Implications for bcd mRNA localization from spatial distribution of exu protein in Drosophila oogenesis. Nature 1994, 369:400-403. 12. Baulcombe DC, Chapman S, Cruz SS: Jellyfish green fluorescent protein as a reporter for virus infections. Plant Journal 1995, 7:1045-1053. 13. Heinlein M, Epel BL, Padgett HS, Beachy RN: Interaction of tobamovirus movement proteins with the plant cytoskeleton. Science 1995, 270:1983-1985. 14. Haseloff J, Amos B: GFP in plants. Trends in Genetics 1995, 11:328-329. 15. Hu W, Cheng CL: Expression of Aequorea green fluorescent protein in plant cells. FEBS Letters 1995, 369:331-334. 16. Sheen J, Hwang SB, Niwa Y, Kobayashi H, Galbraith DW: Green fluorescent protein as a new vital marker in plant cells. Plant Journal 1995, 8:777-78. 18. Haseloff. J. Siemering, K.R., Prasher, D. & Hodge, S. Removal of a cryptic intron and subcellular localisation of green fluorescent protein are required to mark transgenic Arabidopsis plants brightly. Proc. Natl. Acad. Sci. USA.